Liverpool skipper Steven Gerrard’s failure to qualify for the FA Cup final on his birthday could be further compounded by the painful reality that he could be leading his team in a guard of honour for champions-elect Chelsea at Stamford Bridge next month, the Daily Mail reports. The Reds take on Chelsea on May 10th which could be the first fixture following the Blues clinching the Premier League title which would mean a guard of honour for the champions. Gerrard doesn’t possess many happy memories in fixtures against Chelsea, not least his now infamous slip which effectively ended Liverpool’s title hopes last season, and applauding Jose Mourinho’s side onto the pitch would be slightly awkward. 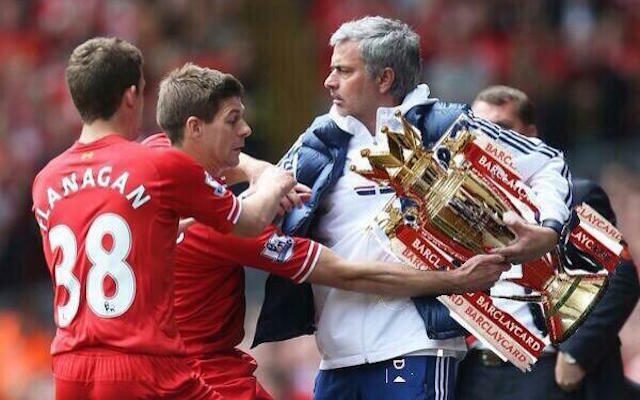 Mourinho’s move for Gerrard in 2005 is well documented and many have wondered how his career would have fared had the move transpired and it seems ironic that he could end his Liverpool career congratulating Chelsea on another Premier League title. Despite his Reds career tailing off, those with a slightly longer memory than four weeks will remember one of the greatest midfielders European football has ever seen.